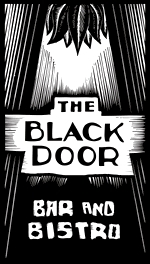 Last night my husband took me to a new spot for dinner, The Black Door on Main St in Montpelier, VT. Now we had been here before for drinks but never have had a chance to do dinner. Neil called to make reservations and check on vegan options and the hostess let him know that the Eggplant Bucatini without the shaved cheese was vegan and the Cumin Spiced Tofu was vegan. After hearing this I went on to check their wine list to see which ones were vegan and to my luck a variety of their wines, both red and white, were vegan. We showered and got dressed up (it’s pretty nice and a bit pricey) and headed on our way. We were sat at a nice table for two and had great service and great wine and beer. Our meals came and everything was delicious! The meals came (we got one of each to share) and they were great. The Eggplant Bucatini was very good however the shining plate was the Cumin Spiced Tofu which was just amazing- my husband said it was one of the best meals he’s had in a long time, even better than anything I’d made! (I had to agree). Our only issue with our meal is that they were particularly small and we were very hungry after having had a small lunch and working out we were ready for something filling. We came to the conclusion that this was the type of place you do appetizer, entrée and dessert- not just an entrée as we had done (oh well it was our first time). Just when we thought we’d have to go home and have a snack our waitress comes back to let us know that there is one vegan dessert tonight, our ears perked up, it was apple cinnamon sorbet. We ordered a bowl to share and let me tell you this was one of the best vegan desserts I’ve had. It was like apple pie in sorbet form without the crust. Overall our dining experience was great- great food, good service, great atmosphere. We’d definitely go back and the best part is they have a seasonal menu so we will hopefully get to experience a new and amazing meal once again. That place sounds awesome. I love it when omni restaurants are accommodating to vegans…especially with dessert!